I’m working as a SD professional in an MNC. 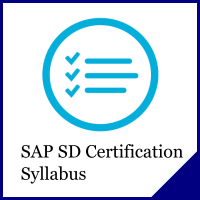 I want to discuss to take SAP SD certification but a little confused. Please guide me regarding SAP exam and how it will be beneficial to me. I’m an SD/MM/LE consultant with 8 years’ experience. The certificate will definitely get you the interview with small-to-medium SAP consulting companies since these businesses need certified consultants for them to boost their profile to their clients, as well as a requirement for getting higher level SAP Partner status. The certification acts as a leverage also for getting a pay increase in your job. Another way you can benefit in this is that if a company had to choose between a person with certification and another without but your skills are equal, company will tend to prioritize a certified person. Interviews tend to be more lenient if you are certified, knowing that you have gone through the brutal questions and passed the SAP test.